"Here's an easy, thick potato soup. Potatoes are boiled with celery and onion and then reduced to a rich, creamy texture. I use one per cent milk, but any milk should work fine." In a large pot over high heat, combine the potatoes, celery and onion with the water and bring to a boil. Reduce heat to low and simmer for 20 minutes. Drain the water, reserving 2 cups of water in the pot. Add the milk, butter and potato flakes. Stir all together well until thickened, about 5 minutes. Season with salt and pepper to taste. Great recipe.Quick and easy but great taste. My family loved it. Even my teenagers. I felt the soup needed more flavor. And the consistency was more like soupy mashed potatos. It was quick to make but not my favorite potato soup. This is a great recipe! This is the recipe that I have been making for years. I do add a little garlic powder. 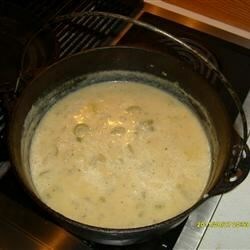 Easiest way I've seen, to quickly make potato soup. And it's not bad.